Please refer to our stock # 9977 when inquiring. A student of Scots artist, Scott Lauder, John Burr studied at the Trustee’s Academy in Edinburgh. He moved to London in 1861 with his brother and fellow painter, Alexander Burr. Upon his arrival Burr began exhibiting at the Royal Academy. He continued to exhibit there until 1882. In addition, he exhibited at Suffolk Street and the Old Watercolour Society. 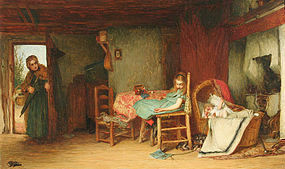 Burr is known for his genre paintings involving small children and domestic scenes. Wood, Christopher. Dictionary of British Art: Victorian Painters. (1995). Harris, Paul and Julian Halsby. The Dictionary of Scottish Painters. (1990).